The Indianapolis Colts today signed linebacker Carlos Fields to the practice squad and released tight end Konrad Reuland from the practice squad. Fields, 6-1, 238 pounds, was originally signed by the Oakland Raiders as an undrafted free agent out of Winston-Salem State on May 16, 2014. He then spent time on the practice squads of the Tampa Bay Buccaneers and New York Giants. In 47 career games at Winston-Salem State, Fields totaled 321 tackles (183 solo), 34.5 tackles for loss, 8.0 sacks and five interceptions. As a senior, he led a defense that ranked first in Division II, as he was named the Central Intercollegiate Athletic Association (CIAA) Co-Defensive Player of the Year. Fields also earned CIAA Defensive Player of the Year honors as a junior. Reuland was signed to the Colts practice squad on October 21, 2014. For his career, he has caught 12 passes for 90 yards in 26 career games (three starts) with the New York Jets (2012-13). Reuland was originally signed by the San Francisco 49ers as an undrafted free agent out of Stanford on July 27, 2011 and was waived on August 31, 2012. He was then acquired from waivers by the Jets on September 1. The Indianapolis Colts today signed wide receiver Chandler Jones to the practice squad and released running back Jeff Demps from the practice squad. Jones, 5-9, 185 pounds, was first signed to the Colts practice squad on September 30, 2014 and was released on October 21. He was originally signed by the Cleveland Browns as an undrafted free agent on May 12, 2014 and was waived on August 4. Jones set career records at San Jose State for receptions (248), receiving yards (3,087) and touchdown receptions (29) and became the first player in school history to record at least 50 receptions in all four years. Demps was signed to the Colts practice squad on October 22, 2014. He was originally signed by the New England Patriots as an undrafted free agent out of the University of Florida on August 17, 2012. Demps was acquired by the Tampa Bay Buccaneers in a trade with the Patriots on April 27, 2013. He played in two games in 2013 and recorded one rush for 14 yards, three receptions for 21 yards and four kickoff returns for 93 yards. INDIANAPOLIS – Behind a career-day from Steelers quarterback Ben Roethlisberger, the Colts did not have the ammo to complete a historic comeback. The 51-34 defeat for the Colts was a stark contrast from the blueprint they executed the week prior against the Bengals. The Colts (5-3) will now travel to New York for a Monday night meeting with the Giants (3-4). ABSENT PASS RUSH– The collective pass rush from the Colts defense that has piled up 20 sacks the last few weeks, couldn’t muster that same disruptive nature on Sunday. The Colts hit Roethlisberger just once in 49 pass attempts and the Steelers quarterback used that ample time to turn in a career afternoon. THIRD DOWN STRUGGLES – Coming into Sunday, the Colts had allowed a staggering four third-down conversions in their last 41 attempts. It was a number that is rarely seen in the NFL. On Sunday though, Steelers were able to convert 8-of-13 third-down attempts and staying ahead of schedule was key in Pittsburgh chewing up nearly 40 minutes of possession. INJURIES MOUNTING – The injury report for the Colts will be monitored closely this week after Vontae Davis (knee) and Erik Walden (hip) both left Sunday’s game and did not return. Neither Reggie Wayne nor Trent Richardson saw any game action Sunday. That’s four key starters dealing with injuries as the Colts have an extra day of rest this week. MONCRIEF EMERGES – Rookie Donte Moncrief was certainly a bright spot on Sunday. Moncrief had seven catches for 113 yards and his first NFL touchdown highlighted the best game of his young career. The 21-year old receiver showed a little bit of everything on Sunday, from his elite open field speed, to having the necessary size to make a difficult touchdown grab. PROTECTING LUCK – Luck was sacked just twice in 45 pass attempts but took too many hits against the Steelers. At times, the Colts had to keep Dwayne Allen and Ahmad Bradshaw in for blocking purposes, thus negating two of the team’s receiving weapons. This week’s “Back-Up of the Game” presented by Venyu is defensive tackle Ricky Jean Francois. When it was announced pregame that Arthur Jones would miss his fifth straight game due to a high ankle sprain that meant Ricky Jean Francois would once again be in the starting lineup. Just like he has done in Jones’ absence, Francois was very impressive. He finished the afternoon with three tackles, a sack and two quarterback hurries. Francois was part of a Colts defense that allowed just 135 total yards and recorded the first shutout for the franchise since 2008. “To be able to shut out the Bengals, one of the best teams in the AFC North, it was something just to be thankful about,” Francois said after the game. With how the Colts defense has played this season, it’s hard to remember that the unit is missing a guy like Jones, Robert Mathis and even Jerrell Freeman for four weeks. The depth is evident though, across all three units of the defense, and is a major reason why the Colts put together a performance like Sunday. “Playing as a family, that’s the biggest thing, a lot of people just talk about it, but as you can see, it’s a family in this locker room that is playing,” Francois said after the 27-0 win. “Especially the defense, we got certain guys that are not playing with us out there so we’re out there playing for them so their energy is inside of us and it makes us play all out. INDIANAPOLIS – In what will be the Colts final home game in a month, they put together a performance to remember for the crowd at Lucas Oil Stadium. For just the sixth time in franchise history, the Colts recorded a shutout thanks to a 27-0 win over the Bengals. The Colts (5-2) will now turn their attention to the Steelers (3-3) and a 4:25 p.m. EST kickoff on Sunday afternoon. CHAMPIONSHIP LEVEL DEFENSE– Cory Redding said it best after the game “it’s a new era.” Yes, a high-octane offense is still in Indianapolis but for this team to play deep into January, defensive efforts like we’ve seen the past few weeks need to continue to happen. Sunday’s effort is beyond impressive considering the Bengals offense being a top-10 unit coming into Week Seven. MORE PRODUCTIVE OFFENSE – It was overshadowed on Sunday but it was yet another productive afternoon for the Colts offense. The unit piled up more than 500 yards and Andrew Luck tied a franchise record with his fifth straight 300-yard passing day. If we are nit picking, red zone efficiency will continue to be a focus going forward for the Colts offense. RUNNING BACK DUO SHINES – The running back tandem of Trent Richardson and Ahmad Bradshaw ranks right up there with any other in the NFL. Sunday was another showcase of that as both finished with more than 80 yards from scrimmage. The Colts 171 rushing yards are the most the team has had in over a year. MORE PASS RUSH SUCCESS – Coming into Sunday, Bengals quarterback Andy Dalton had been sacked just twice in 151 pass attempts. The Colts got Dalton on the ground three times in 38 attempts with Bjoern Werner recording his team-leading fourth sack of the year. SERIOUS AFC CONTENDER – A fifth straight win pushed the Colts record to 5-2 with two road contests on the horizon before a Week 10 bye. The Colts now sit just a game behind the Broncos for the top spot in the AFC. Indianapolis’ lead in the AFC South could grow to two games if Houston falls to Pittsburgh on Monday Night Football. 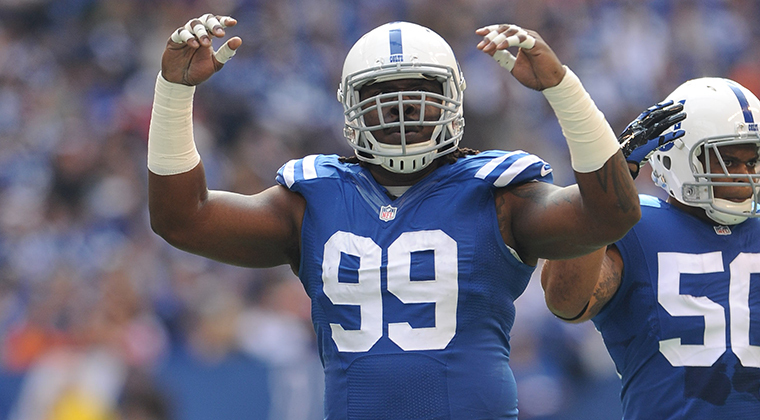 The Indianapolis Colts today announced that tackle Xavier Nixon will return to practice with the team. He will remain on Injured Reserve/Designated for Return during this time. The Colts have up to three weeks from today to elevate Nixon to the 53-man active roster or he will remain on Injured Reserve for the remainder of the season. He is not eligible to play until the team’s Week 9 game against the New York Giants on November 3. Nixon was placed on Injured Reserve/Designated for Return on September 3, 2014. He was first signed by the Colts from the Washington Redskins practice squad on September 24, 2013. Nixon played in four games for the Colts in the 2013 regular season, making one start at left guard in a Week 16 victory at Kansas City. He also saw action in both postseason contests. Nixon was originally signed by the Redskins as an undrafted free agent out of the University of Florida on May 2, 2013. The NFL today announced that Indianapolis Colts punter Pat McAfee has been named the AFC Special Teams Player of the Week for Week 6. This marks the first time he has earned the award in his career. In the Colts’ 33-28 victory over the Houston Texans, McAfee recovered an onside kick, which led to a touchdown. It marked the third consecutive onside kick recovery of the season for Indianapolis. The rest of the NFL is a combined 1-of-13 (7.7%) on onside kicks this year. McAfee contributed with four punts for 159 yards in the game, pinning three of them inside the 20-yard line. He also added six touchbacks on kickoffs. McAfee leads the NFL in punting net average (44.8) and kickoff touchbacks (33) in 2014 and ranks sixth in punting gross average (47.5). In September, he earned AFC Special Teams Player of the Month honors. McAfee is the second Colts player to earn AFC Player of the Week honors this season. Quarterback Andrew Luck won the award for his performance in Week 3 at Jacksonville. HOUSTON – The Colts stretched their win streak to four games on Thursday night with a 33-28 victory down in Houston. With the win, the Colts took the solo lead in the AFC South, while moving their divisional record to 3-0 on the year. The Colts (4-2) will now have a mini-bye week before the Bengals (3-1) head to Lucas Oil Stadium on October 19. HILTON’S HEROICS– There’s just something in the air when Hilton takes on the Texans. The last time Hilton got into the end zone in a regular season game was down in Houston last year. He did that and much more on Thursday night. The speedster had nine catches (in nine targets), for 223 yards, falling one-yard shy of the Colts franchise record for a game. MORE SPECIAL TEAMS TRICKS – It was another gutsy, pivotal special teams call that allowed the Colts to seize early control. It’s remarkable the Colts have executed three onside kicks this season where the rest of the league is 0-for-8. The confidence Chuck Pagano has in his special teams units is through the roof and this team feeds off that trust. PASS RUSH FRENZY – Over the last four weeks, the Colts have piled up 16 sacks in 120 pass attempts. It’s been a collective group effort with 10 guys chipping in with sacks in 2014. The handful of sacks on Thursday night was highlighted by Bjoern Werner’s strip fumble that clinched the Colts fourth straight victory. EARLY DIVISION CONTROL – When the Colts began a stretch of three AFC South games in four weeks, they found themselves at the bottom of the division. A month later, they are alone at the top. The Colts will now have an extended break from division foes with just one AFC South game until Week 15 (vs. Jacksonville on 11/23). MINI BYE WEEK – Chuck Pagano said after the game “no injuries” which is a nice bonus going into the weekend off. The Colts will now play three games against teams with better than .500 records before a bye week on 11/10 (CIN, at PIT and at NYG).